Three months later, Clooney's idea is about to go live. Starting Dec. 30, the Satellite Sentinel Project  a joint experiment by the U.N.'s Operational Satellite Applications Programme, Harvard University, the Enough Project and Clooney's posse of Hollywood funders  will hire private satellites to monitor troop movements starting with the oil-rich region of Abyei. The images will be analyzed and made public at www.satsentinel.org (which goes live on Dec. 29) within 24 hours of an event to remind the leaders of northern and southern Sudan that they are being watched. "We are the antigenocide paparazzi," Clooney tells TIME. "We want them to enjoy the level of celebrity attention that I usually get. If you know your actions are going to be covered, you tend to behave much differently than when you operate in a vacuum." You don't have to be a spook to have an eye in the sky anymore. Private firms with names like GeoEye, DigitalGlobe and ImageSat International have a half-dozen "birds" circling the globe every 90 minutes in low-Earth orbit, about 297 miles (478 km) up. The best images from these satellites display about 8 sq. in. (50 sq cm) of the ground in each pixel on a computer screen. That is not enough granularity to read a car's license plate or ID a person, but analysts can tell the difference between cars and trucks and track the movements of troops or horses. "It is Google Earth on lots of steroids," says Lars Bromley, a top U.N. imagery analyst. But you need money for it. A hurry-up order of what Bromley calls a "single shot" from a satellite covers an area of about 105 sq. mi. (272 sq km) and costs $10,000. A rush job on a "full strip" image of land roughly 70 miles (115 km) long and 9 miles (14 km) wide could run nearly $70,000. Sentinel is launching with $750,000 in seed money from Not On Our Watch, the human rights organization Clooney founded along with Don Cheadle, Matt Damon, Brad Pitt, David Pressman and Jerry Weintraub. Clooney predicted he won't have much trouble raising more money once the project goes live. Prendergast's group, the Enough Project, is the human-rights arm of the liberal Center for American Progress; it recruited Bromley's team at the U.N. and brought in analysts from the Harvard Humanitarian Initiative to pore over the images as they arrive. "Generally, what we have done in the past is an after-the-fact documentation exercise," Bromley explains. "This is proactive, wide-area monitoring," he says. 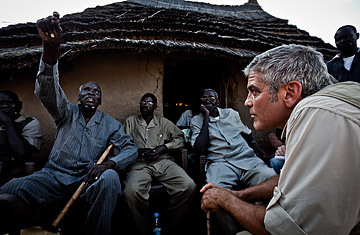 Clooney, who has made four trips to Sudan since 2006, believes Sentinel might have applications in other global hot spots. "This is as if this were 1943 and we had a camera inside Auschwitz and we said, 'O.K., if you guys don't want to do anything about it, that's one thing,'" Clooney says. "But you can't say you did not know."